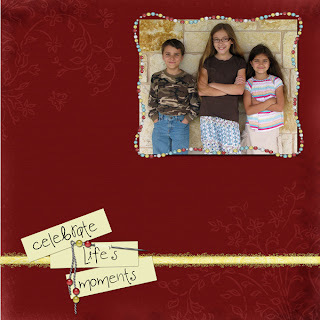 Below you will find my very first ever attempt at digital scrapbooking. It's very simple with not many layers or embellishments, but it was fun to make. I'm using Photoshop Elements and some free digi-scrapping kits from the web. With a little practice, I hope to put together some really cool pages. I love all types of scrapbooking - just never seem to have enough time to do either to my satisfaction. Looks good!